Shanti studied at the Guildhall School of Music and Drama. He has recorded with Kenny Wheeler, Bobby Watson, Tim Garland, The Brand New Heavies, The Stereophonics and Basement Jaxx. He has played in concert with members of the Buena Vista Social Club, including Ruben Gonzales and Cachaito, also appearing with Frank Emilio Flyn’s ‘Los Amigos’. 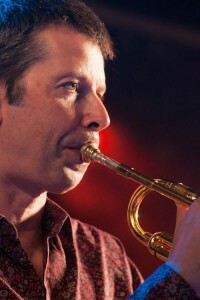 He has also played with Matt Bianco, supported Wayne Shorter, performed with LPO and the BBC Concert Orchestra, composed for the ABRSM jazz syllabus, and contributed transcriptions to John McGlaughlin’s DVD ‘The Gateway to Rhythm’. He has worked extensively with Alex Wilson, touring the UK and Europe, supporting the Afro-Cuban Allstars, the Lincoln Centre Jazz Orchestra with Wynton Marsalis, and recording on 5 of Alex’ CDs. He is on the staff at Centre for Young Musicians in London, is MD of a world music project for Essex and Cambridgeshire music services, has been a visiting lecturer at the Guildhall and an external examiner at the Royal College of Music. He has a CD out on Candid Records, entitled ‘Round Trip’ and a book of elementary world music trumpet tunes, ‘Trumpet Globetrotters’ published by Oxford University Press.